We were most impressed the wonderful city of Calcutta - possibly one of the most attractive central urban areas in the country in terms of architecture, wide, un-choked roads and cultural aspects. But then again, it was designed by the British, so that stands to reason! Two days was just enough time to get a good feel for this once leading city of India - there were so many historic, Raj-era buildings to see. 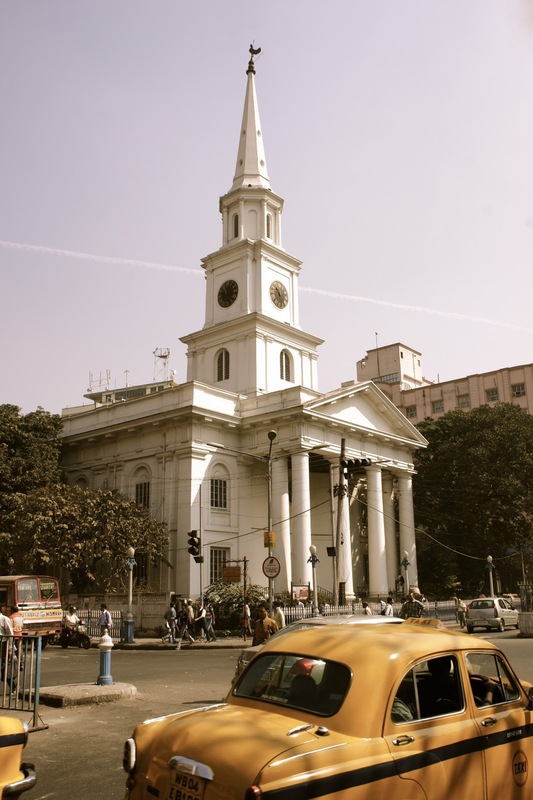 And I loved the fact that Calcutta is a sort of Indian New York - the boulevards filled with its famous yellow Ambassador taxis - honking and vying for business. 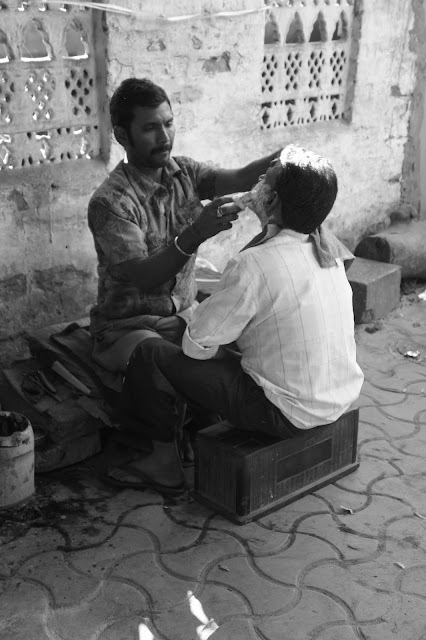 Unlike in the centre of Mumbai (which I like to compare every other city to), there were few slum areas to be seen and hardly any pavement dwellers. Despite this, I understand that Calcutta (the capital of West Bengal and third most populous area in India) is actually one of the country's poorest cities. So I suspect that these areas are out of sight, further away from the centre. We stayed at a very convenient hotel near the heart of the city - Hotel Casa Fortuna - which although not much to look at from the outside and being right next to a major road artery - was actually very nice indeed. Our (slightly small) room was nicely furnished, the staff were extremely pleasant and helpful and the 'strictly' vegetarian food at the in-house restaurant was amazing. The service in the restaurant was also some of the best that we have experienced at any hotel in India. Highly recommended! It was very easy to grab one of the fun Ambassador taxis from just outside of the hotel to any of the major sites. And once in the centre we were able to walk around much of the city unhindered. 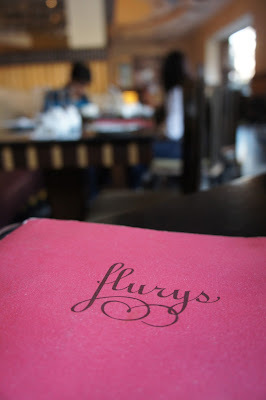 Just after we arrived on the first day (after an Indigo flight direct from Mumbai) we went in search of food at the renowned and highly recommended Flury's on Park Street. Unfortunately we were too late for one of their famous English breakfasts, so I ordered a lasagna and Mr Jules ate fish and chips. Both were absolutely vile! And the place was very faded and depressing that lunch time. I am afraid I would not recommend Flury's for anything other than one of their famous breakfasts! We then asked a taxi driver to take us to the magnificent Victoria Memorial - a marvel of British Architecture and kind of a cross between Marble Arch and St Paul's Cathedral. We seemed to have run out of luck again, because when we got there, it was almost closing time and there was a massive queue of Indians trying to get in before the gates were shut. There were none of the usual queue jumping mechanisms for foreigners, so we decided to give it a miss that day. But as the Memorial would also be closed the next day - a Monday, we came back later that night for the Son-et-Lumiere display. To be honest, the display was a bit lame which was a shame (ha! that rhymes!) The boomingly loud slide show had evidently not been updated since the 1970s and the light display using the Memorial as a backdrop was not very inspiring. I would love to give some of these Indian museum curators a lesson in making the best of their amazing buildings! Victoria Memorial - "sits with an old world sobriety at the heart of a busy city"
The rest of the next one and a half days were spent wondering around - mostly on foot as the temperature was relatively cool. After the disaster of Flury's, we had lunch at the fancy La Terrasse restaurant at the Oberoi and I had their very delicious Chicken Kiev. Both evening meals were taken back at the hotel restaurant after exhausting ourselves walking everywhere. Here are the photos. 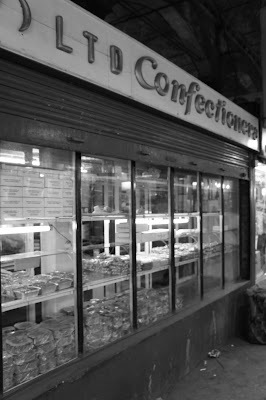 Parts of the city are so timeless that they lend themselves well to black and white or faded photography (plus I was inspired by a friend's recent visit to Calcutta where she took loads of fab B&W photos...thanks Amy!). The Writers Building which now houses the West Bengal Secretariat. 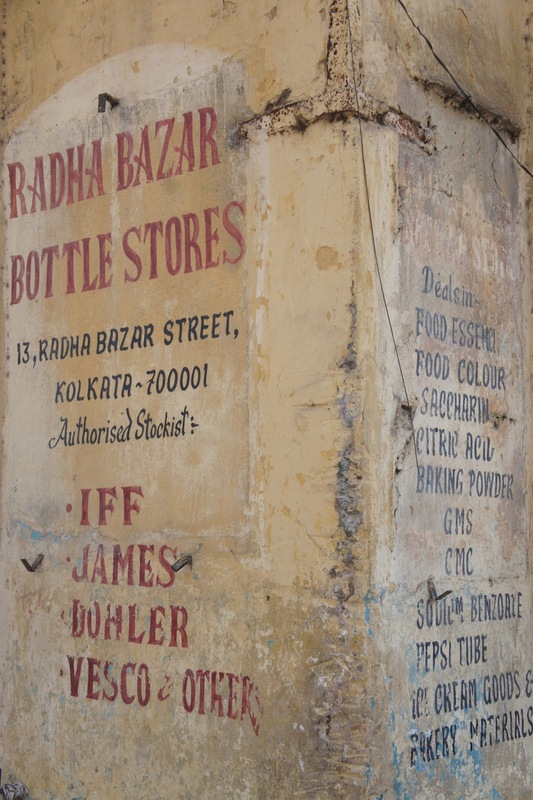 The red brick is very typical in Calcutta. St Andrew's Church - modelled on London's St Martin-in-the-Fields. A reminder that we are still in India! 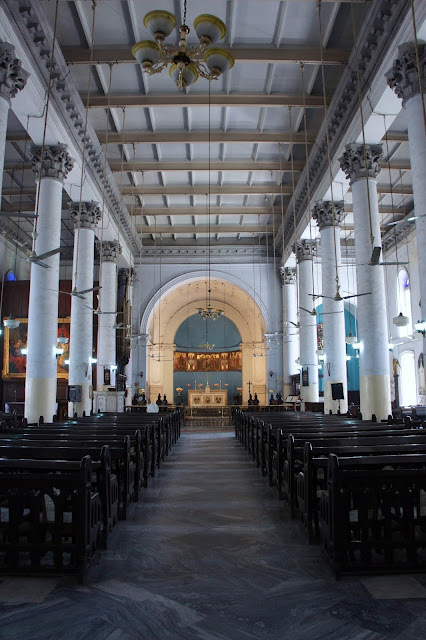 Inside St John's Church - one of Calcutta's oldest churches. Memorial to the 123 persons who perished in the Black Hole of Calcutta. The story goes that 146 Englishmen were imprisoned overnight in a room measuring 5.5 by 4m on one of the hottest nights of the year. 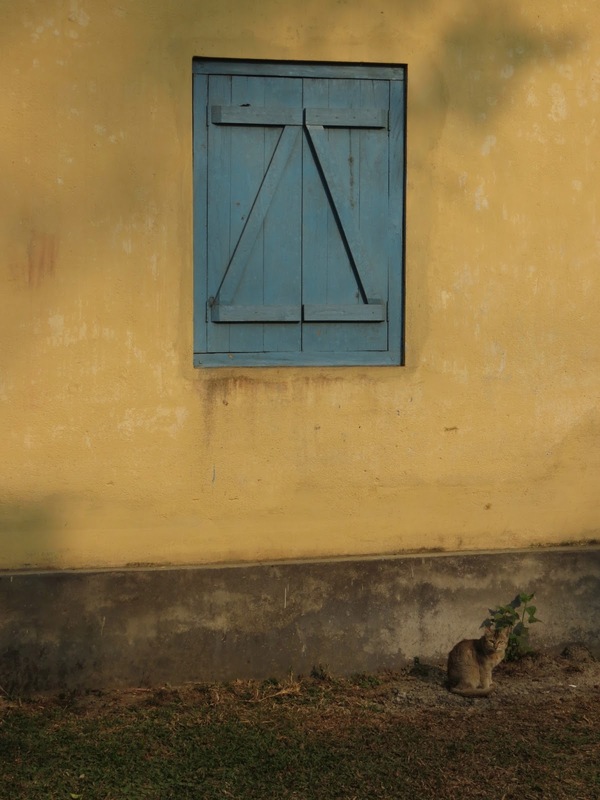 With only two small windows for ventilation, all but 23 had perished by the morning. No one knows where the Black Hole prison was actually located and it is possible that the story is a hoax. Passenger boat on the Hooghly - I just love the name - HOOGHLY! PS. 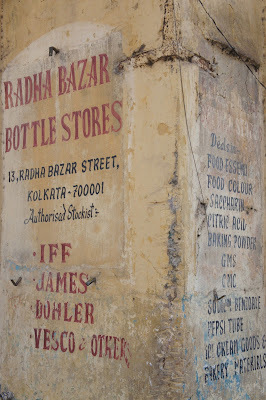 The shopping scene in Calcutta is rubbish! I found a couple of some of the best shops and they aren't worth a mention here. Sorry Calcutta! 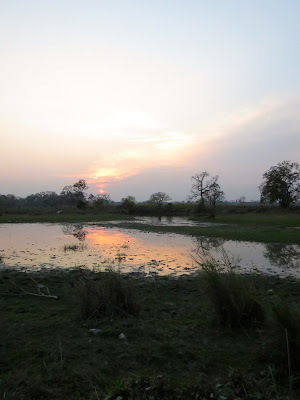 The reason being that I spent an amazing week away with Mr Jules - two days in Calcutta followed by four nights in Kaziranga National Park in Assam. Actually make that five nights - due to a 'bund' on the day we were due to fly back, we were unable to reach the airport due to some pretty violent roadside attacks on cars by political activists. We saw the car in front of us having its windows smashed in by nasty men throwing big rocks, so we turned back sharpish! That aside, our time in the park was wonderful. 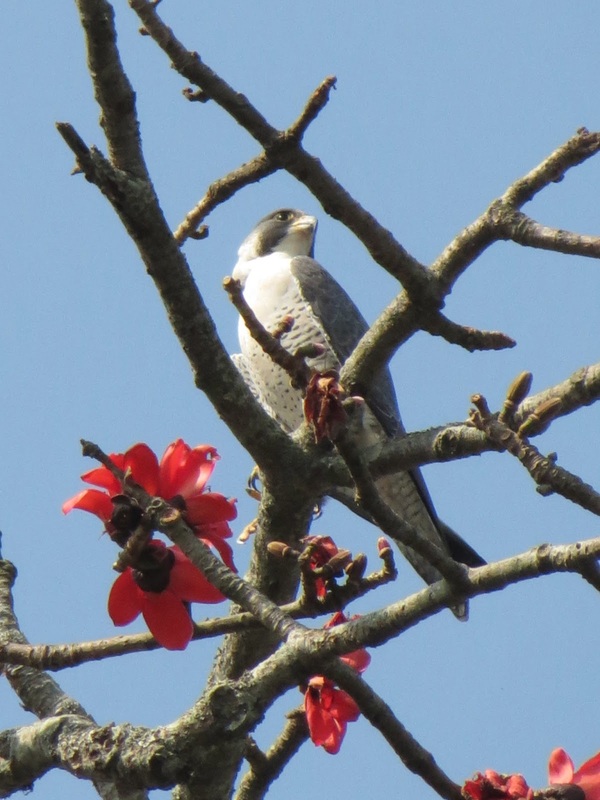 We saw 17 out of a possible 35 species of mammal and over 120 out of a possible 500 species of bird. I know, quoting stats like that makes me officially a nerd.... yes, I know! 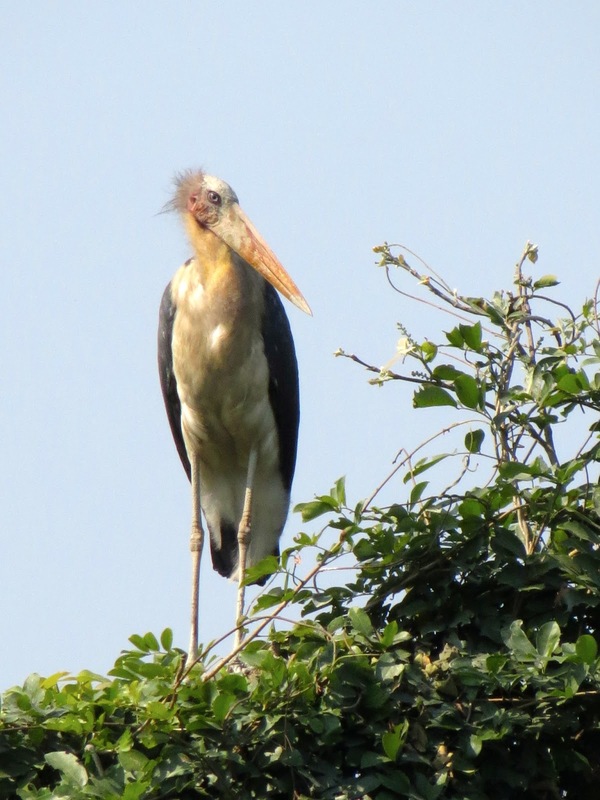 I have to admit, I have become a bit of a twitcher since moving to India (much to the delight of birding Mr Jules and his parents) . But perhaps the effects will wear off in time....give it a chance. 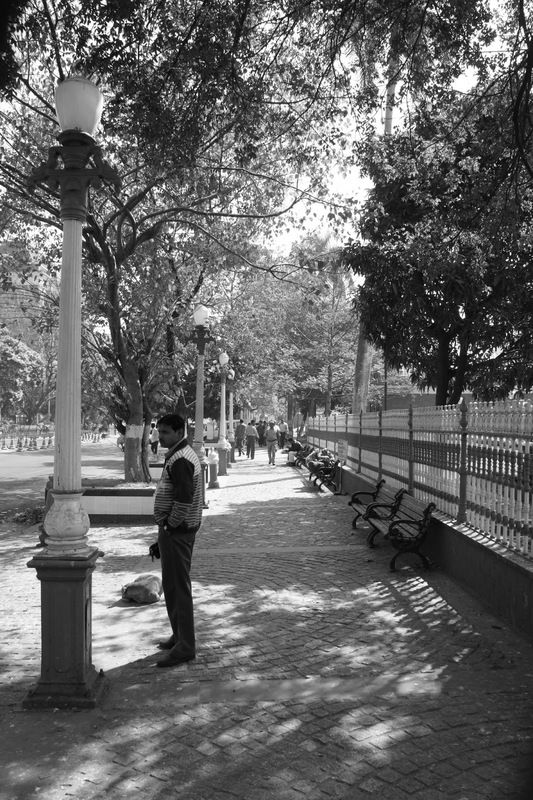 I will come on to Calcutta in another post - this the most Raj-era of Indian cities. A very fine place. Kaziranga is probably one of the lesser known National Parks in India for spotting tigers and other wildlife - Ranthambore, Bandhavgarth and Corbett being the most famous. 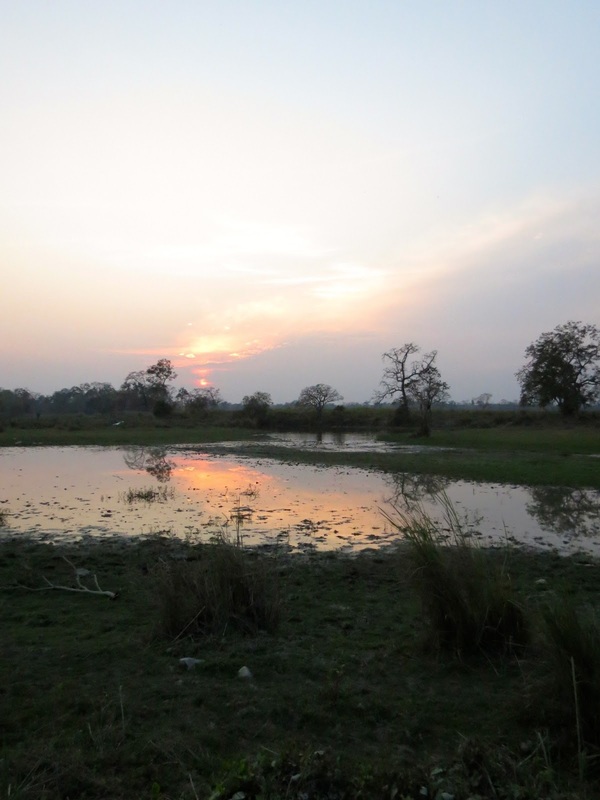 But in fact there are still around 106 tigers lurking in the long grass here, so it's worth making the trek (three hours flight to Calcutta, one hour flight to Guwahati and then five hours drive from there to Kaziranga). As there are only something like 1,200 Bengal Tigers left in the whole of India, if you see one, you have to treasure the moment. Unfortunately we only glimpsed one of these very endangered animals through binoculars from quite a considerable distance - I am not sure that such a sighting counts unless it is with the bare naked eye. This was the glimpse of the Bengal Tiger that we got - better than nothing I suppose! 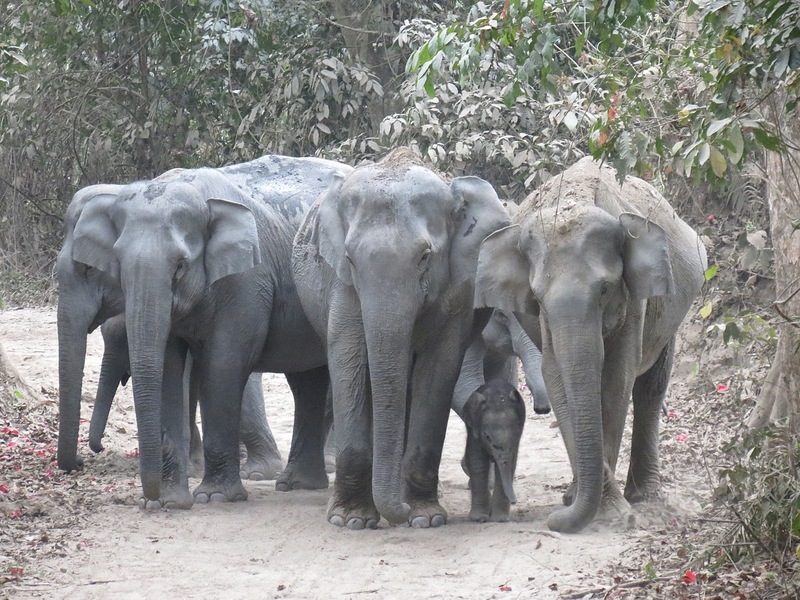 My David Attenborough moment - as we were driving along - this group of females with their one month old baby appeared on the road. They worked together to surround the baby and protect it from us, the perceived threat. They started making noises and walking towards us - flinging dirt - so we turned around and backed away. Out of the birds we sighted, it was undoubtedly the Great Hornbill that caused the most delight. I was amazed to be able to take the picture below. We also saw several species of eagles, vultures and owls and dozens of other, colourful birds. We have referred to our various bird books and noted down the names if anyone is interested! In all, we did seven safaris - six in a jeep and one on elephant back (one safari was on the day we turned back from the airport). 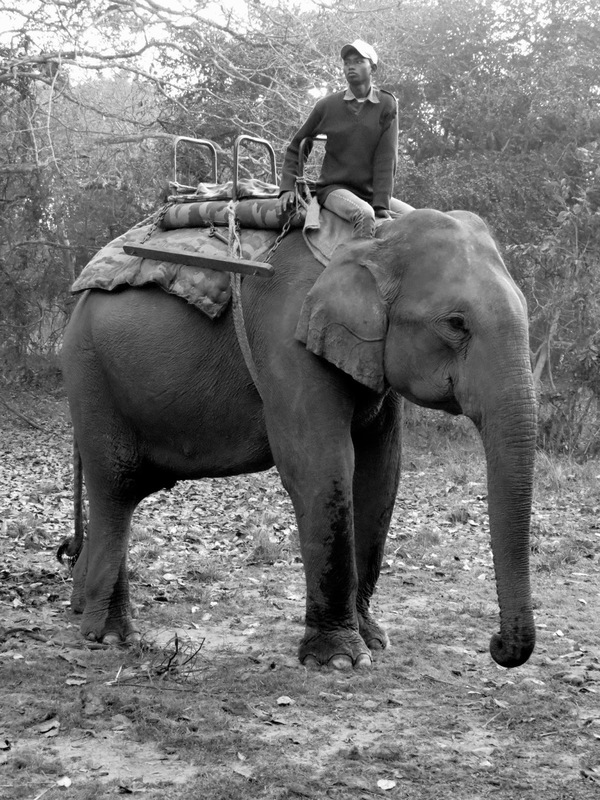 Of course, the one on elephant back was amazing. We had to get up at 4.30 though, making BombayJules very grumpy. We pitched up at the embarkation area in the dark and as it gradually got lighter, we could see these massive dark shadows moving towards us. 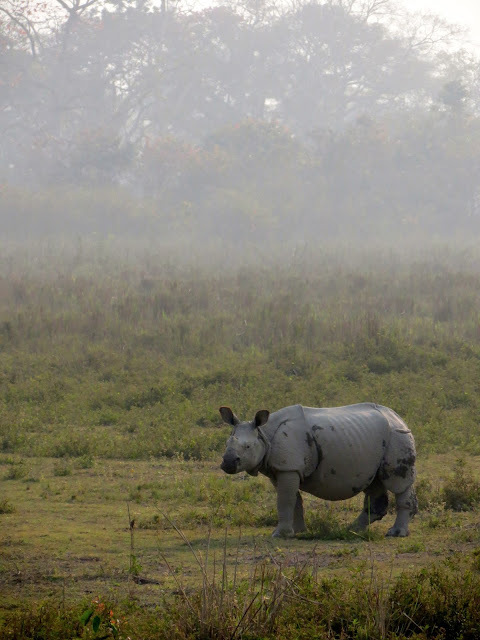 And then as the sun rose a bit more we could properly see the outlines of these magnificent beasts who had arrived to transport us through the early morning mist. 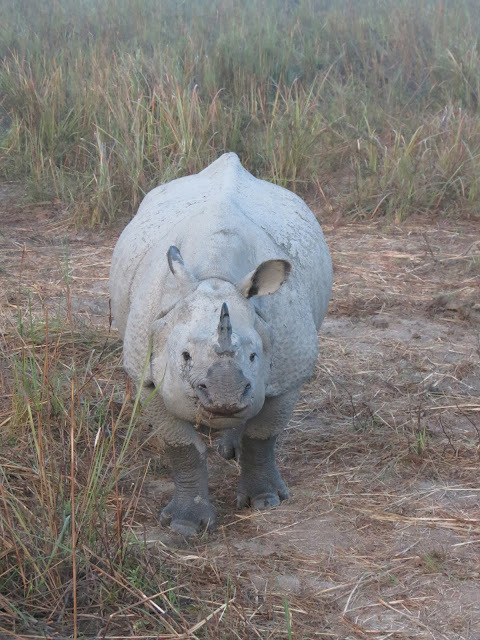 You can get this close up to a one horned rhino! Our guide Somnath and his driver were marvellous - we had the same guys for all seven safaris. 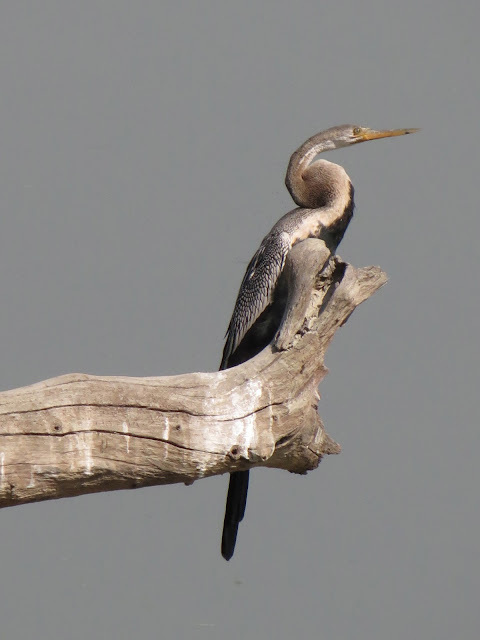 Somnath really knew his birds and was more eagle-eyed than the eagles we saw...spotting brown birds up against brown tree bark from quite a distance - shapes that just looked like smudges to me and which I still could not discern despite lengthy instructions to locate them! 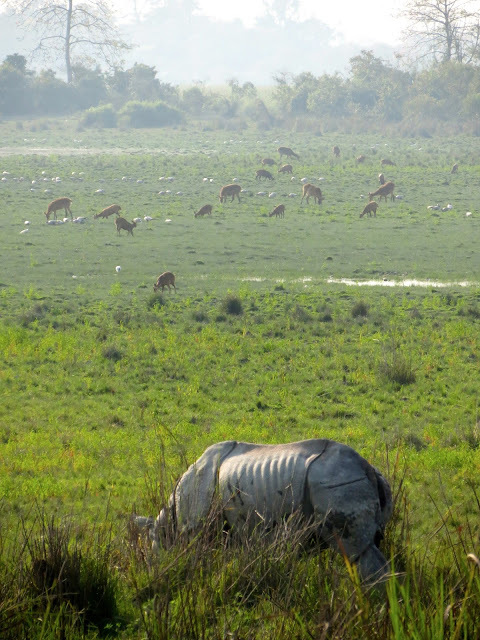 Kaziranga has to be one of the least spoilt parks in the country. The place was not over wrought with jeeps ferrying about huge numbers of foreign tourists (although we did encounter one VERY annoying group of British birders, shame on them). If you want to spot a tiger, you have to sit and wait and watch patiently. There is no obvious grapevine where the guides ring around each other so that they can then rush you to the spot where the tiger is. I am sure that this would take away the charm of making a sighting - I would rather not see a tiger than clash with 300 other people in an attempt to do so. 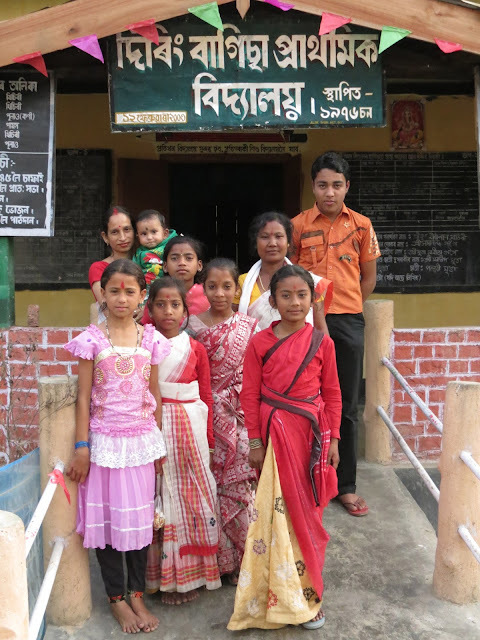 The local people in Assam retain a real innocence and the village children delight in running up to you to say hello (actually they shout BYE-BYE!, BYE-BYE! whether you're coming or going which is so sweet!). 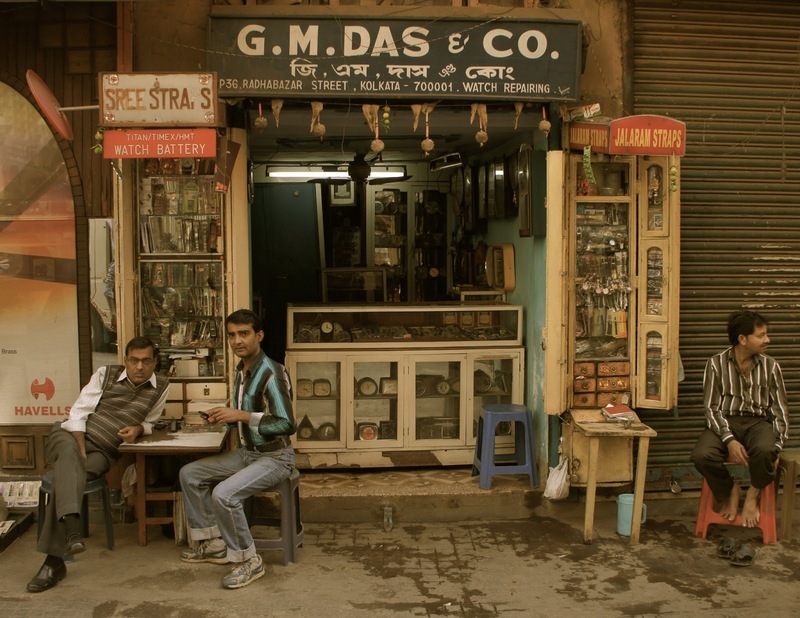 Even better, you won't find a Kashmiri salesman (my pet hate) trying to flog you a crappy pashmina - and nobody puts their hand out for a hand-out. But BombayJules style, I did still manage to eek out a retail opportunity! 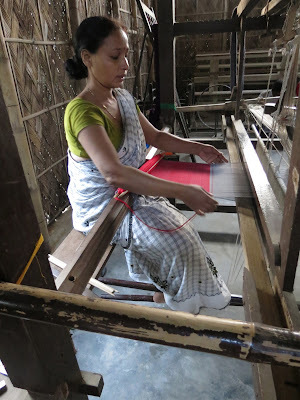 In the backwater of a tiny village mostly inhabited by tea plantation workers, our guide (at my request to track down some handicrafts) showed us a small, local outfit producing hand-loomed fabrics. Gorgeous silks and cottons - not as fine as you might find in Rajasthan but still with a certain rustic charm. I purchased a simple mulberry silk dupatta for a mere 250 Rs (GBP 3), a cotton sari type piece of fabric (which looks a bit like a pub tea-towel to be honest) for 150 Rs (GBP 2) and another, thicker hand-loomed silk scarf - which was more realistically priced at 1,500 Rs (GBP 20). Oh and Mr Jules bought himself a man-scarf, so charmed was he by this little money-making enterprise! Actually the enterprise is an NGO - and there to support local women who can sell their products in the shop and create a little financial independence for themselves. Inside the handicraft shop - sniffed out by your very own BombayJules! Our hotel was pretty decent. The Iora Retreat is Indian run but it was managed so efficiently that I thought it couldn't be. The Iora is on quite a large complex considering the basic rural nature of the area - with most facilities including a good sized swimming pool and spa. There are two restaurants, one serving standard Indian and Chinese fare, and another serving traditional Assamese recipes. It was a shame that I had bad stomach ache for the whole week caused by my malaria medication - as I totally lost my appetite. We therefore did not venture into the Assamese restaurant and I mostly survived the week on a diet of plain fried rice. And there weren't even any mosquitoes around in the end! Our room was much bigger than standard and well furnished with a nice big balcony overlooking beautifully kept gardens. The service in the hotel was exemplary - especially in the restaurant, the room-service and housekeeping. And for about forty five quid a night, not bad value! This holiday was a bit of a treat for Mr Jules who is an avid nature-lover and in fact it was probably my most favourite get-away after the Ambassador Car Rally that we did last October. We are even thinking of going back - to see if the tigers will come out properly next time! This baby elephant followed us on our elephant safari and even came up to sniff us when we got off. Too cute! This is the elephant we rode on. We forgot to take a photo with us on it! Pretty exciting scene as the rhino starts to traverse the road in front of us. School kids on safari (of course too many kids in the jeep and no seat belts! One for my groups series. These are some of the many armed parked rangers who constantly battle poachers. Poachers who kill rhinos for their horns, elephants for their tusks and Bengal Tigers in the name of Chinese medicine. Complete heroes in my mind - after night falls, they roam the park seeking out men who are armed with Russian AK47s - with only vintage rifles left over from WW2 to protect the animals. A very French scene in the middle of Kaziranga! These kids were too cute for words!